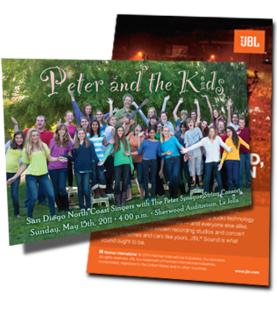 5.5" x 8.5" Flyers are a very affordable option for marketing a business or organization. 5.5x8.5 flyers are also a very popular option for political mailers. America's Printer can print 1/2 page flyers on 10pt cardstock or 100lb glossbook in either Portrait or Landscape style. 1/2 page flyers are often used as a postal mailer, or for Sale Events, Counter Cards and Product Announcements. If you are looking to print and mail political flyers or want to mail your custom mailers, ask your APC Rep about our in-house America's Mailer direct mail services.